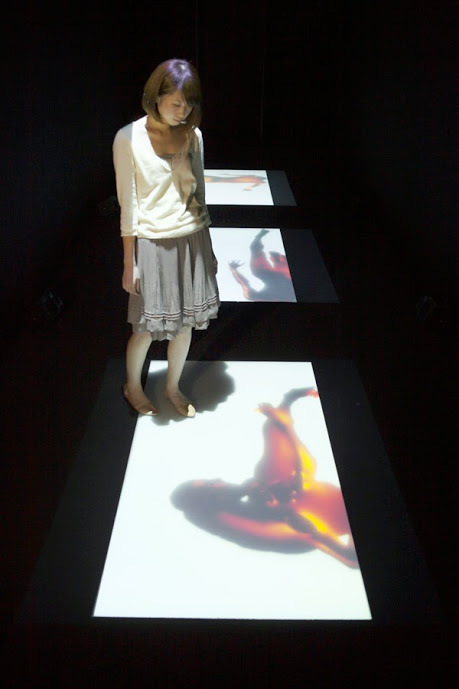 This work has two objectives: one is to develop the possibilities of tactile viewer experience with the vibrations of sounds through allowing viewers to touch the vibrating screen; the other is to preserve the dancer by automatically producing the choreography, thus redefining the existence of a dancer as perpetually and timeless. This video was shot in high vision from under the floor through a transparent acryl panel sized 15 mm x 1.8m x 0.9m, which is the size of one tatami mat. The ceiling has halogen lights and I placed four fluorescent lights just above the floor, helping the video to capture the dancer’s skin in detail and the precise movements of the dancer’s center of gravity. The screen is made with frost acryl panel and half milked color acryl panel bound together. The surface of the work thus has less dots, feathering the square light source of the projector. This may also create a texture of the shadow from the video and the viewers who may touch the screen. The computer program automatically produces the choreography by choosing random patterns. First, there are five different scenes that are ordered in time. The choreography is chosen by the program, which have been sorted and grouped by dancer movements, positions and other distinctive facets like slowness and aggressiveness. In addition, the program always chooses pairs of images for each movement, combining each frame with its counterpoint image: mirror reversed, upside down reversed or negative and positive reversed. The dance program consists of three projection screens but the computer program has four screens. Using the fourth screen, which viewers cannot see, I deform the stable structure of the three screens and create unpredictable sequences, silences and blanks on the three actual screens.